Psycho, one of Alfred Hitchcock's iconic films, didn't come together very easily. Hitchcock's studio, Paramount Pictures, didn't like anything about the film and denied him a proper budget. So the director went solo and funded the film through his television company Shamley Productions. The budget was tight -- less than $1,000,000. Costs were firmly controlled. Hence why, in 1960, the film was shot in black and white. We won't allow you to cheat yourself. You must see PSYCHO from the very beginning. Therefore, do not expect to be admitted into the theatre after the start of each performance of the picture. We say no one -- and we mean no one -- not even the manager's brother, the President of the United States, or the Queen of England (God bless her)! Theatre managers initially balked at the idea, fearing financial losses. But Hitchcock had his way. And he was right. Long lines formed outside the theaters. 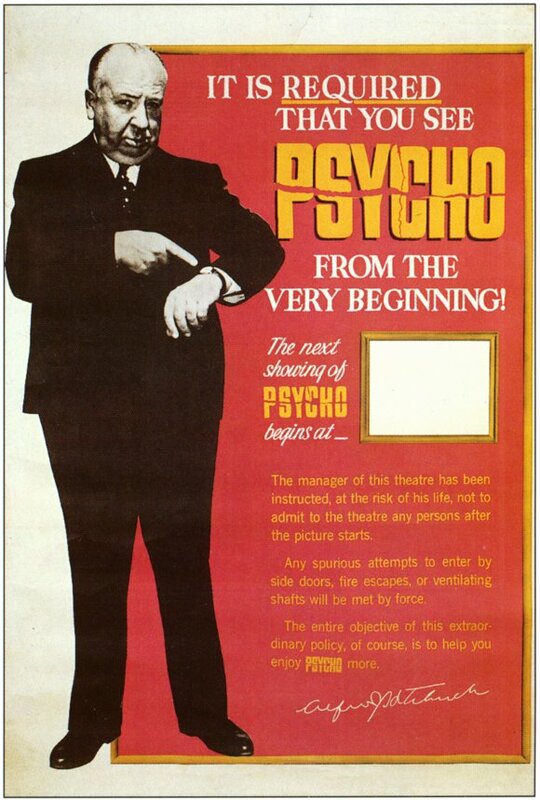 Psycho enjoyed critical and commercial success, so much so the film was re-released in 1965. All of that just because Hitch decided to off his protagonist in the first twenty. A genius he. Hitch didn’t decide to off his protagonist in the first twenty. That comes straight out of Robert Bloch’s novel, Psycho. And it wasn’t the first twenty, it was the first forty.